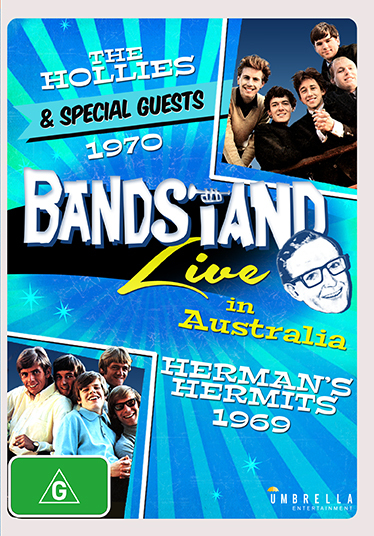 In 1969 and 1970 Bandstand celebrated two of Britain’s biggest recording acts – broadcasting studio performances of legendary rock outfit THE HOLLIES and beat sensation HERMAN’S HERMITS. Considered at the time the most consistent British hit makers after the Beatles, with 20 international top sellers over six years, five piece band The Hollies deliver a dynamic set of songs including He Ain’t Heavy, He’s My Brother, Carrie Anne, Just Like A Woman, a rollicking medley of hits including Bus Stop and Sorry Suzanne as well as a rousing rendition of the Dylan classic Blowin’ In The Wind. Also featuring performances from Australian artist Dianne Horder and local legend Kamahl, receiving his first ever gold record and singing the songs Somehow Someway and Life Must Go On. With 12 consecutive hit records in the US Top Ten behind them, Manchester band Herman’s Hermits join Bandstand with their ‘happy sound’ for a string of greatest hits including A Must To Avoid, There’s a Kind of Hush, My Sentimental Friend and Silhouettes. This episode also features local performers Jenny Green, Pat Carroll, gentleman of rock’n’roll Johnny Rebb, Allan Morrisson and future Oscar® nominee Jacki Weaver singing a ‘sweetly sad song about teen romance’ – Frank Mills.